The other night I had the privilege of attending a private dinner hosted by our neighbors, who invited the owner / founder of Atherton Wine Imports - George Derbalian and his wife Sue-Min to be the wine stuarts for an aspiring group of wine aficionados. Atherton have been around for over 30 years and established reputation for carrying some of the top names in Burgundy, including producers like Pierre-Yves Colin-Morey, Groffier, Roty, Hudelot-Noellat, Anne Gros, and many others whose wines I cherish in my cellar. They also import some other famous regions, but it's Burgundy where I have typically seen and bought their bottles. The dinner hosted by a prominent Chinese family consisted of home-cooked Shanghai-style (non-spicy) seafood, vegetables, poultry and pork-based courses. I have noted in the past that Chinese food when not spicy, tends to pair well with both white and red burgundy, and this experience further cemented that belief. George and Sue-Min seemed like a delightful couple, and it was my true pleasure to hear their remarks on the producers, vineyards, and vintages before us. 1. 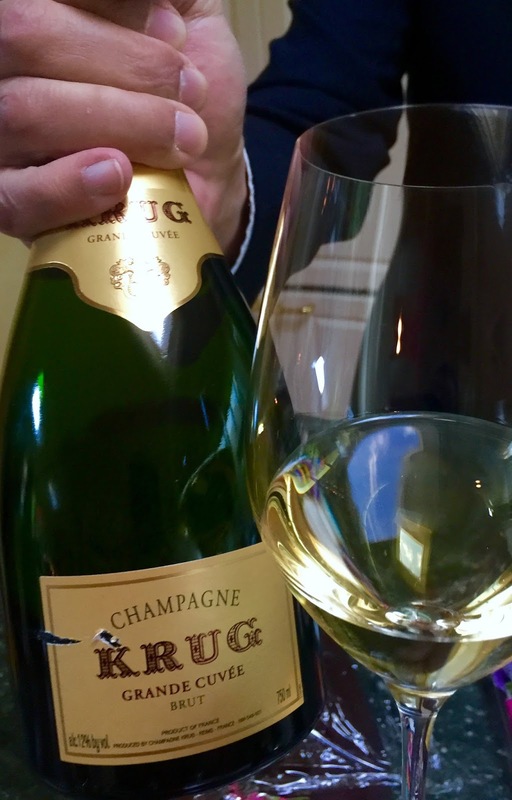 Upon arrival, guests were treated with a glass of chilled Krug Grande Cuvee (NV), one of my favorite champagnes, always classy, with great energy and precision, and a touch of gingery complexity and a brioche note. Krug for me strikes the perfect balance between ripeness, roundness and crystallinity. Two superb white burgundies and seven red burgundies followed to delight taste buds. Here are my notes. 2. 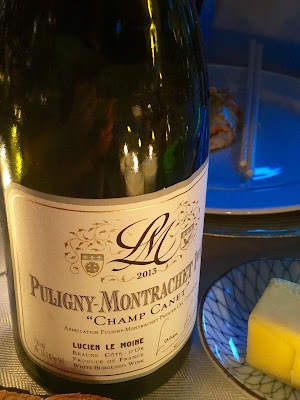 2013 Lucien Le Moine Puligny-Montrachet 1er Cru Champ Canet - despite the 2013 vintage having reputation for producing leaner, higher acid, zesty, crystalline whites, it was clear that the richer style of Lucien Le Moine resulted in something different... and decadent. Exotic notes of botrytis were evident, with tropical fruits supported by excellent acidity and oak - an incredibly delicious pairing for a ginger stir-fried crab with noodles. 3. 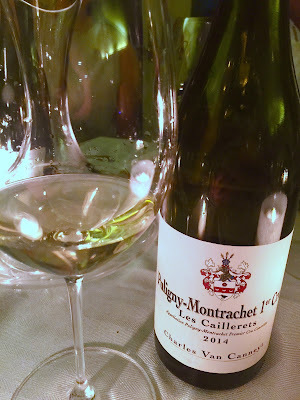 2014 Charles Van Canneyt Puligny-Montrachet 1er Cru Les Caillerets - my first time with Charles' own (negociant) label, one of the two excellent wines represented at the dinner, and another stroke of greatness of the 2014 vintage for the whites of Burgundy, this wine was much more classic in profile than the previous one - more crisp, structured, very clean and pure, with perfect balance of elements. As all other 2014 white burgs I've tasted so far (probably 20 or so), this is already delightful, and will only get better with a few years of age! 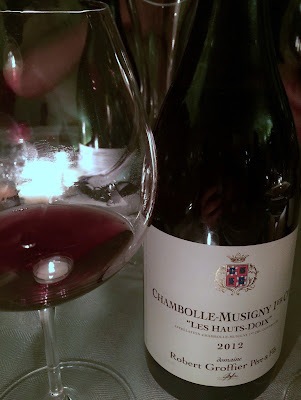 For the reds, we had three excellent examples of the same Chambolle-Musigny 1er Cru vineyard that I had never had before - Les Hauts Doix, which was exciting! We then had a brand-new 2014 Vosne Petits-Monts from Hudelot-Noellat's Charles Van Canneyt who now makes some clearly excellent wines under his own label. We finished the progression with three Grand Cru's. 4. 2013 Lucien Le Moine Chambolle-Musigny 1er Cru Les Hauts-Doix - very open and fruity, this is a pleasure to drink now for its breadth of aroma and exuberance. The structure is currently obscured by the fruit. 5. 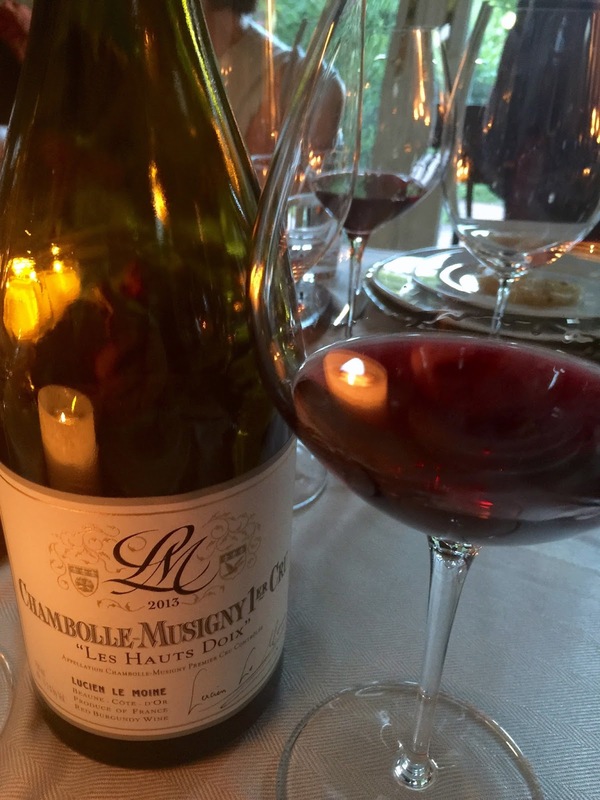 2012 Groffier Chambolle-Musigny 1er Cru Les Hauts-Doix - comes across as more serious, with more power, more structure, and more refinement. Superb with time. 6. 2008 Groffier Chambolle-Musigny 1er Cru Les Hauts-Doix - with few more years of age under their belt, the 2008's are starting to drink well. This bottle was great - some secondary development, excellent balance of fruit and earth. 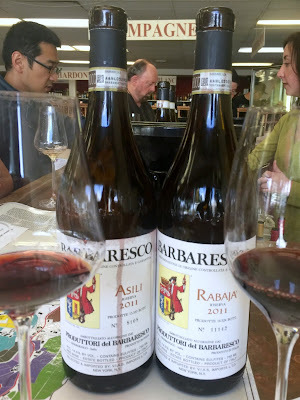 Broad wine without hard edges, and my favorite of the 3 examples of this vineyard, although the 2012 seems to be destined for even brighter future. In general, the Groffier style came across as more refined, while Le Moine was (as usual) more opulent and luscious. 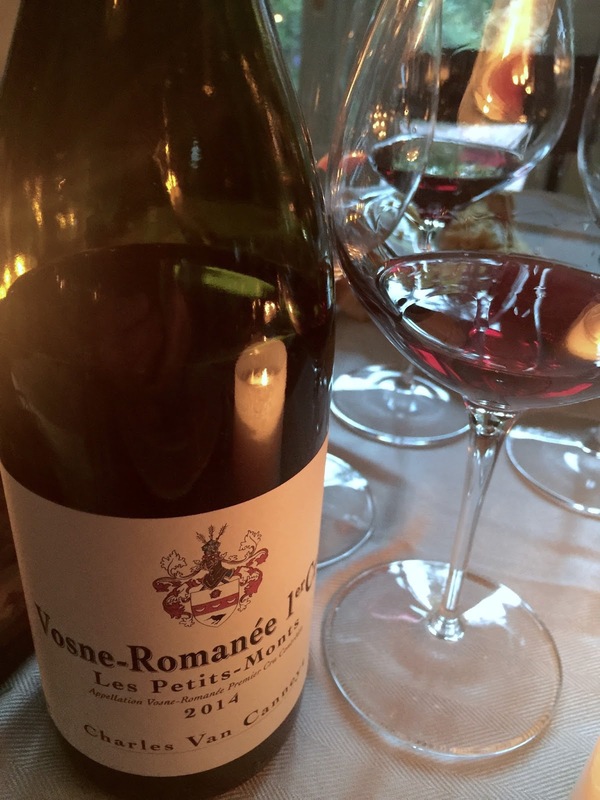 Then came the excellent 2014 Vosne-Romanee from Charles Van Canneyt. 7. 2014 Charles Van Canneyt Vosne-Romanee 1er Cru Les Petits-Monts - an excellent vineyard, this was the only Vosne Romanee in the line-up and the more serious, more sculpted character of the commune was evident. Blind, I could have mistaken it for a 2013, but perhaps with a slightly better balance, and less acidity sticking out, which pointed to 2014. There are several excellent producers such as Joseph Drouhin, Georges Noellat, Comte Liger Belair and Mongeard-Mugneret now competing for top honors at Petits Monts, and I suspect Charles Van Canneyt will soon be among them. While this 2014 is still not fully integrated, it seems very well balanced. I wish I had more time to spend with it, but alas, the next set of wines was ushered in. The party closed with three red Grand Cru's. 8. 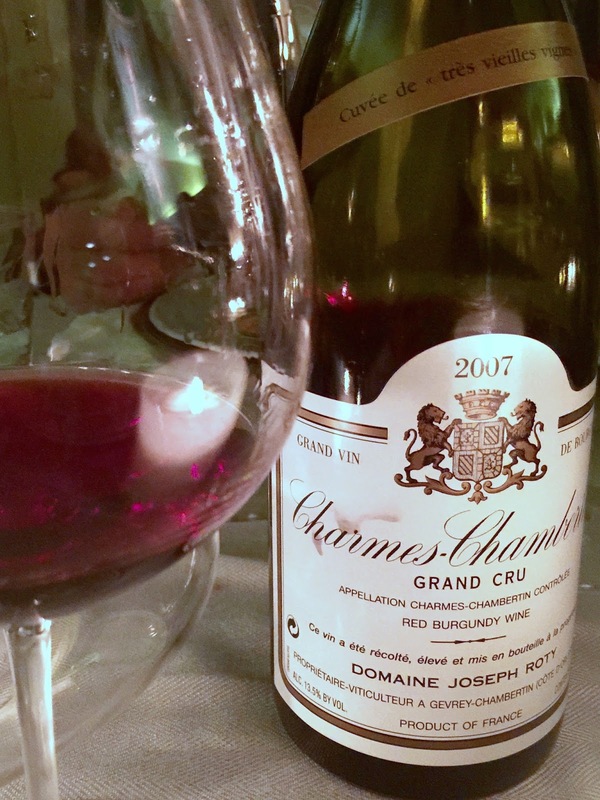 2007 Domaine Joseph Roty Charmes-Chambertin Grand Cru TVV - this is a flagship wine for the famous domaine, and considered by many to be the best example of that vineyard due to very old vines. 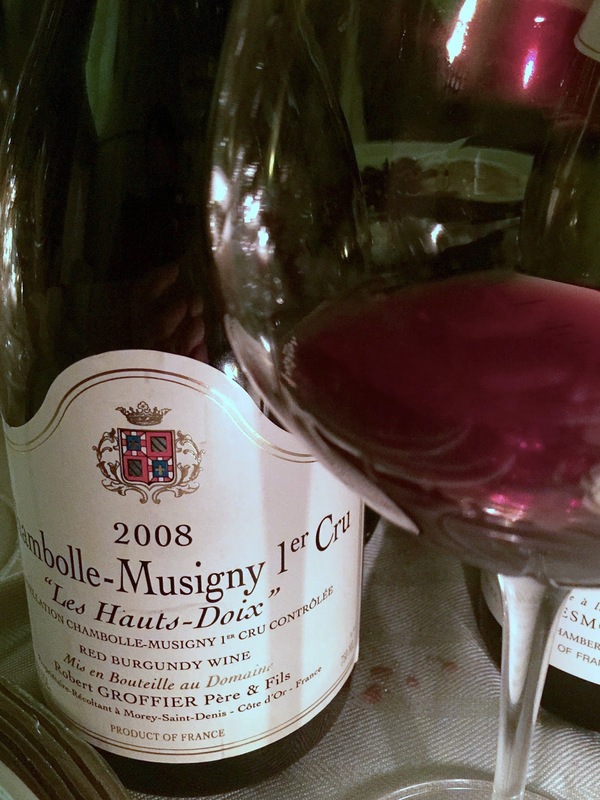 It is also hardly a secret to Burgundy lovers that 2007's have been drinking superbly for a couple of years now. 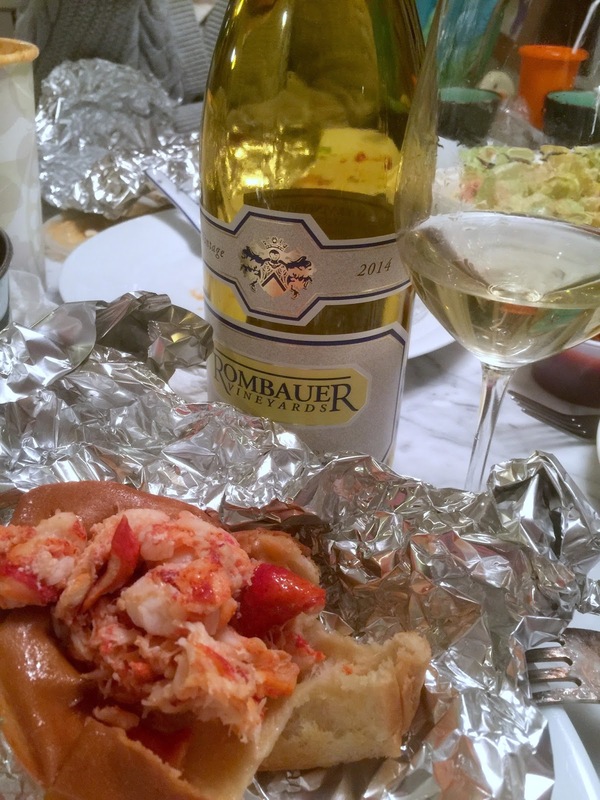 So this was the right time to take a look at this wine, and we were not disappointed. Though Roty's Charmes has a reputation for being deep, dark, extracted, and destined to last decades, it was apparent that the lighter 2007 vintage served well to soften the wine and make it approachable relatively early. Excellent density of material, perfectly balanced between red fruits, earth and herbs, still with long evolution ahead, this wine easily betrayed its pedigree without any overt flash, exoticism, or opulence. In the evening's exemplary line-up, this was the quiet but confident star. 9. 2002 Frederic Esmonin Chambertin Clos-de-Beze Grand Cru - the most elevated grand cru at the dinner, from an excellent vintage, this wine should have been fantastic. But the truth is it was relatively uninteresting, and perhaps too young and undeveloped (?) Not bad but nothing special. Bummer. Frederic Esmonin is much better known for his Ruchottes-Chambertin, so I was not totally surprised that his Beze did not shine. 10. 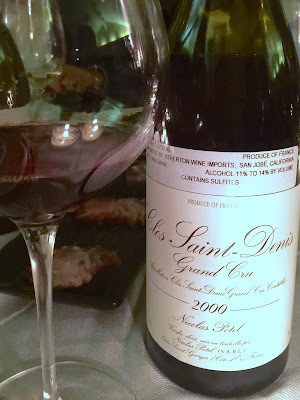 2000 Nicolas Potel Clos Saint-Denis Grand Cru - I have had this wine a number of times over the last few years and it has never disappointed, as first described in my ecstatic note three years ago. It has continued to evolve and is getting better. This was the bottle I brought, and funny enough, it had been imported by Atherton. It was stellar this time too, with pungent, vibrant, powerful, complex cherry, pomegranate and forest notes, clearly grand cru weight and intensity. Drinking well now, but no hurry. The wonderful evening organized by the gracious hosts underscored the versatility and charm of Burgundy. Having multiple bottles of Le Moine, Groffier, and Charles Van Canneyt, and that's before even getting to grand cru's, is not something that happens every day, and in fact, each bottle would have brought great pleasure to accompany a whole meal all by itself. Drinking them all in one evening was clearly too much "fun", and I paid the price (of hangover) the next day, but who's complaining? Another La Paulee is in the books. 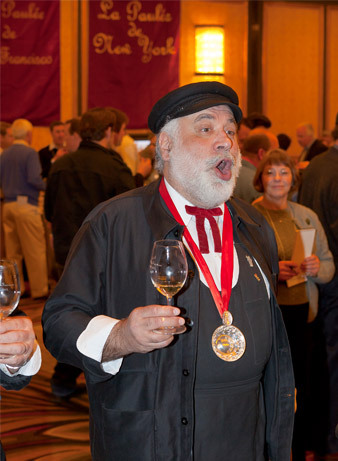 The 2016 edition roared through San Francisco to the delight of Burgundy lovers. The 3-hour (all-too-short) Grand Tasting focused on the 2013 vintage, and it did not disappoint. The reds and whites across the board showed clear and consistent vintage characteristics. For the reds, this meant tart acidity and sufficient ripeness and depth without overt over-ripeness, suppleness or fat of such recent years as 2009 and 2012. The whites were consistently excellent, with high acidities, citrus, minerality, crystalline purity, and loads of grip. The best reds I think came from higher cru's, which had a bit more flesh on the bones to balance out the high acidity of the year. Same with whites - the higher cru's with a bit more sweetness were well balanced by a level of freshness and purity rarely seen. I have generally recommended caution with 2013 whites, as this is a rather leaner, high-acidity vintage. The tasting did not change my mind, but it also confirmed that good producers made classic white burgundies from great terroirs. 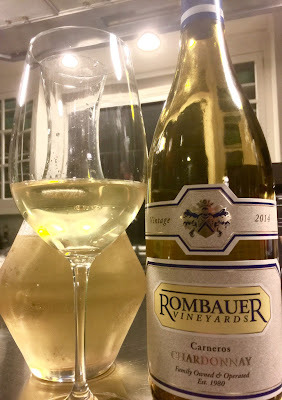 From my limited experience tasting the 2014 whites, that appears to be a much surer vintage across the board, with more flesh and slightly better balance. Yet, the 13's tasted here were beauties that will deliver pleasure over many years. Overall, in terms of the entire lineups presented at the tasting, the most consistently delicious producers were Fourrier, Hudelot-Noellat, Drouhin, Chateau de la Tour, Bernard Moreau and Antoine Jobbard. Obviously it's hard to omit Roulot, Lafon , Dujac, Mortet, Lamy, Pierre-Yves Colin-Morey from this list, and they certainly poured excellent wines, some of which were among the very best, and I would be happy with any of their wines in my cellar, but they just didn't impress me across the board quite as much. The top 3 reds of the tasting for me were Fourrier Clos St Jacques, Mortet Lavaux St Jacques, and Hudelot-Noellat RSV. Arnaud Mortet noted the lowering of new oak in his Lavaux in the last few vintages. I think the sleeker, slightly more angular style of 2013 also worked well in the wine, giving it a level of definition and elegance I hadn't seen since Arnaud took over. 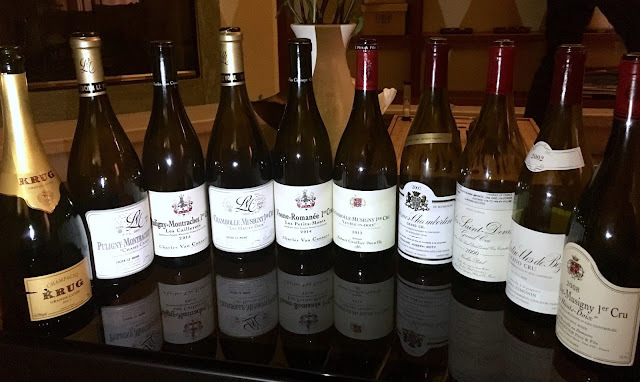 Among the whites, Bernard Moreau Grandes Ruchottes, Drouhin Batard, and Comtes Lafon Charmes were the most memorable. Other notable reds were Domaine Jean Grivot Les Beaux Monts, Dujac Aux Combottes and Clos de la Roche, Chateau de la Tour (all wines), Lafon (Santenots), Hudelot-Noellat (Vosne villages, NSG Murgers), Jadot (Ursules), Drouhin (Chambolle 1er & Clos Vougeot), Camille-Giroud (Santenots), and Chandon des Briailles (Corton-Bressandes). Other notable whites were Domaine Lamy (En Remilly), Paul Pillot (Grand Ruchottes & La Romanee), Pierre-Yves Colin-Morey (Chassagne Caillerets & Meursault Genevrieres), Roulot (the whole lineup), Antoine Jobbard (the whole lineup), Pierre Labet (of Chateau de la Tour -- Meursault Tillets), Mikulski (Poruzots, Goutte d'Or). I must mention the wines of Nicolas Rossignol. They were very distinctive and obviously good quality, but they surprised me with high level of extraction and power, unparalleled at the tasting. The acidity of the year helped balance the wines. Still, I was taken aback by how potently concentrated and ripe they seemed, making me wonder about the alcohol level. Another interesting showing was from Benjamin Leroux, whose Volnay Clos de la Cave des Ducs was very pretty and distinctive and Clos St Denis tasted like a beautiful fruity Barbaresco, delicious but perhaps not exactly what I expect from a burgundy. A few people remarked how much they liked the wines of Grivot. Unfortunately, to me they were too reduced (full of meaty stink and coffee grinds) to appreciate, other than Vosne Beauxmonts which showed enough fruit underneath the mild stink to give a glimpse of future potential. Chandon de Briailles' lineup of two Pernand-Vergelesses and Corton Bressandes was very solid. Camille-Giraud's David Croix is getting much recognition these days in the wine community, but unfortunately only his Volnay Santenots showed well, while NSG Boudots and Clos Vougeot were just so-so for me. 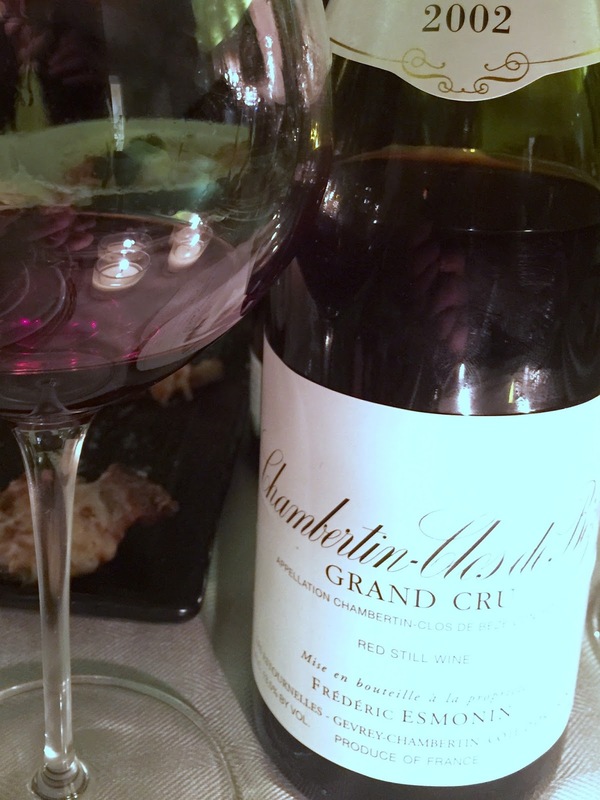 Denis Mortet Gevrey-Chambertin Lavaux St-Jacques - great, darker tone, perfect silkiness, great balance, new oak in 60-70% since 2011 or 2012. Drouhin Batard-Montrachet - intense, zesty, oyster, grippy, long. Grivot Vosne-Romanee Les Beaux Monts - again reduced nose, but the palate is silk fruit, good intensity, very nice, other than reduction, long creamy aftertaste with lingering tannins and sweatness that comes on later. Benjamin Leroux Volnay Clos de la Cave des Ducs - ooh, pretty mint spice, nice. Jadot Beaune Clos des Ursules - very good, deep, tannic, dark fruit, mint, I like it. Chandon de Briailles Corton Bressandes - stem nose, dark, quite serious, long finish, I like it. Chateau de la Tour Clos Vougeot classique - perfume, great tannic palate, delicious fruit, structure. Pierre Labet Meursault Les Tillets - wow, great spice. Nicolas Rossignol Volnay Clos des Angles - sweet, intense, wow big wine! Nicolas Rossignol Volnay Chevret - very stemmy, intense, wow tannic big wine! 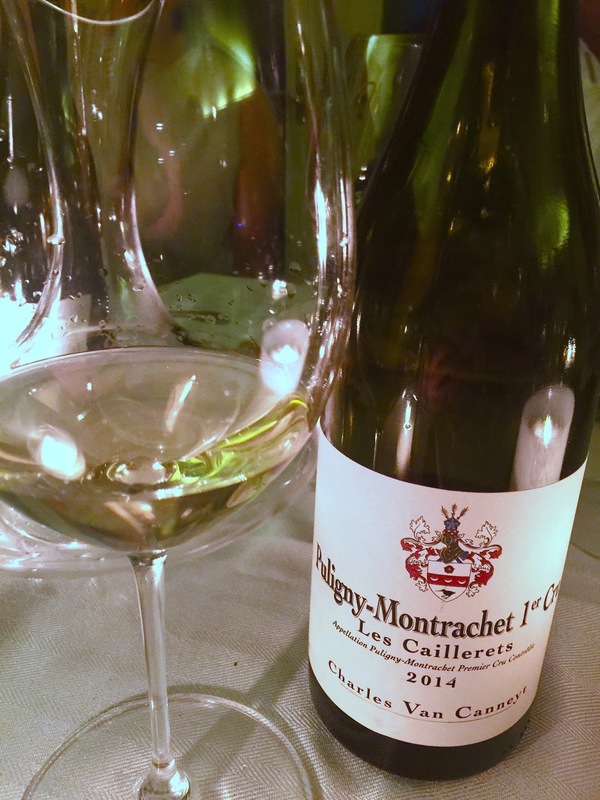 Bernard Moreau Chassagne-Montrachet Les Grandes Ruchottes - sweet, spicy, floral, intense, hint of honey, but fresh with lime acidity. Great. Pierre-Yves Colin-Morey Meursault Les Genevrieres - honey, flowers, cream. I like the sweet and acidic combo. The honey really makes this stand out. Lovely. Roulot Meursault Clos des Boucheres - spice, grippy, sweet. Comtes Lafon Meursault Charmes - nose of straw. Wow, intense, pure, expands in my mouth. Cream, perfect balance, big step up from Clos de la Barre. Comtes Lafon Volnay Santenots-du-Milieu - spice, nice grip, intense and focused. Good. Truly an embarrassment of riches, so to speak, the 2013 vintage gave us many delicious wines which don't seem to need a very extended cellaring. Already showing well, perhaps a few more years will better meld the fruit and acid.